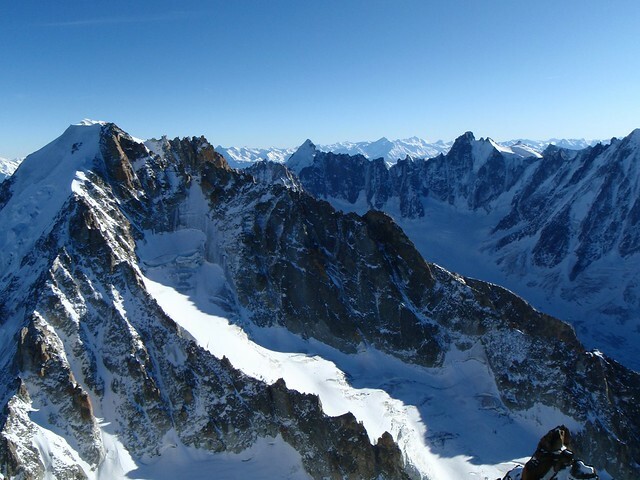 Viewing south from Aiguille du Chardonnet, French Alps. The closest peak to the left if Aiguille d'Argentière. The pointy peak in the centre is Mont Dolent and the highest to its right is Aiguille de Triolet. 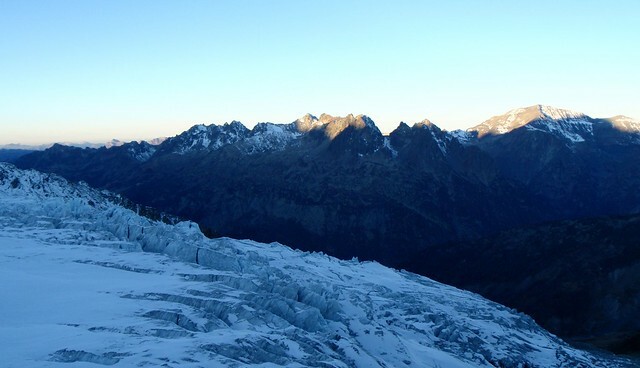 The immediate glacier below is Glacier du Chardonnet and that behind the prominent ridge and in front of Aig. Triolet is Glacier d'Argentière. Summitting — it is one of the primary goals in mountaineering. Kitchen in the winter room in Refuge Albert Premièr. Thibault preparing water from snow, placing a pan on the fireplace. This winter room was excellent in the sense (1) plenty of logs supplied to burn in the fire place, (2) the chimney goes through a bedroom upstairs, which means the bedroom is pretty warm. On this day (Tuesday) we used the hut by ourselves. The following day saw about 10 people. Logically speaking, it does not make much sense. Mountaineerers often deliberately and willingly choose hard ways rather than just trodding up to a summit. If you just want to summit, then why don't you take the easiest way? Alternatively if you want an excitement of the challenge, then as soon as you finish the difficult part of the route, you should be ready to descend to a safety, rather than stretching to the summit via comparatively easy path, braving a potential of associated risks. However it seems climbers are not such a logical creature, and actually many of them do want summitting. After all they are the people that are deliberately engaged in a silly game of sufference, called climbing, so it may not be so surprising that they are illogical. And, I have to admit I am not an exception. Since I moved to Switzerland, I have done a fair amount of climbing in the last couple of months, yet I have never summited a proper alpine peak during the period. Climbing here has been a fun, but somehow I can not help feeling something lacks. I need summitting. I want that. So, when my friend Thibault suggested Aiguille du Chardonnet (in French Alps) via Goulotte Charlet-Bettembourg, I jumped into it. Although it is no way close to the highest peak in the area in terms of height, I remember how significant it looked in my first alpine trip, and have wanted to climb it one day since then. Indeed I did eye up for it last year, but we didn't try in the end mainly due to the weather condition. And the suggested route seems a good fun and challenging enough. A potential trouble is it is physically demanding — the walk-in is fairly long even in summer, let alone this time of year, where the lift being closed we have to walk up directly from the valley and carry foods, cookery and fuels, the hut being not manned. But then what? So went we. And on the day, getting up at 3am, leaving the hut at 4, after a long walk-in, by the time we geared up at the foot of the route, it was the sunrise time — perfect. I lead P1, Thibault P2, then my turn again, P3, the beginning of the crux pitches. In fact P3 itself was found to be fairly easy, Scottish grade III at most. I sped without bothering placing a lot of gear — speed is safety. By the time I spotted a in-situ piton on the left, I was aware that I was running out a fair bit, probably 10 metres. No problem. I will get to the sanctuary in 2 seconds, which is almost within the reach. Easy-peasy. The rope finally became taut and I stopped upside-down. At the edge of my eyesight one of my axes is hurtling down the steep face below and is disappearing into abyss. What…?! How come?! Thibault shouted at me loud. “I think so.” replied I, getting up myself and quickly checking the body and potential injuries. OK, I can feel I have some bruises but they don't feel bad; indeed I was almost unhurt, despite tumbling down on this less than vertical terain with rocks sticking out here and there, equipped with pointy metal stuffs everywhere around me… Lucky me! Thibault later told me that he believed it would certainly be a hellicopter job after he saw (and arrested) me falling. Indeed I later found several of my equipment, including a thermos bottle in my rucksack, were damaged — they all must have contributed to spread/absorb the shock. What an incredible luck!! Thibault asked me what I would like to do. Lower-off? Or else? Well, I am not sure if the rope is long enough to be lowered down to the belay. Moreover, the rope was being caught by a rock spike, which meant I can not simply be lowered down. A thing is I have lost an ice-axe — a big trouble! But anyhow the terrain here is easy enough. Fortunately my injury (bruises) is not too bad. So I proceeded with one axe, this time with most solid axe and crampon placement ever in each swing and step, climbed the 20 metres and reached the belay without problem. I am relieved and at the same time annoyed. How could I fall off on this easy terrain? But I also knew I should be thankful to my incredible luck, really. Thibault came up to me. I am glad to be with my partner side by side in this remote mountain, where we haven't seen a single saul since the previous day's sunset. Thibault leading the crux pitch of Goulotte Charlet-Bettembourg. The first half of the crux pitches (40 metres), WI 4, and P4 for us. It was immediately after my pitch, where I took a massive 15-metres fall. It seemed to somewhat affect Thibault, too, placing more ice-screws (but what we didn't know was I had lost 2 ice-screws in the fall, hence he was a bit short of ice-screws). The temperature was about -5 degC. Thibault seconding P5, Goulotte Charlet-Bettembourg. The second half of the crux pitches (60 metres, WI 4). I lost my ice-axe in the fall in P3, therefore either of us had to climb with one axe only. Thibault kindly let me borrow one of his axes to lead this pitch, which meant he seconded it with one axe only (as I did in P4 and P6). It was OK — we managed to climb cleanly with one axe! 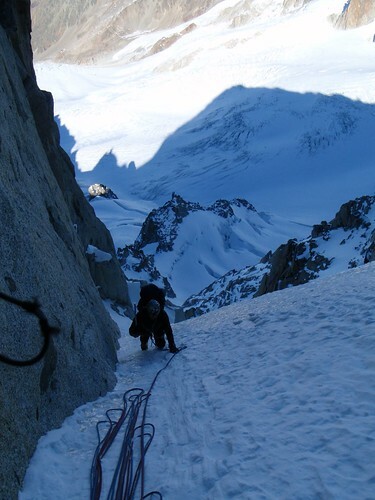 The route situated in the north face, the shadow of Aiguille du Chardonnet is seen below on Glacier du Tour. Then, my turn to climb comes, with one axe. It turned out it was actually all right, as I gauged it would for me. I did grab screws, when I met them, to save my strength. But I didn't fall and I didn't think at any moment I might fall. I climbed in confidence. The thing is that means technically I could lead the pitch with one axe, as a leader doesn't need or use 2 axes in placing runners. While I climb Scottish V with one axe in confidence, how could I fall on Scottish III with double axes?! I asked myself again in anger. 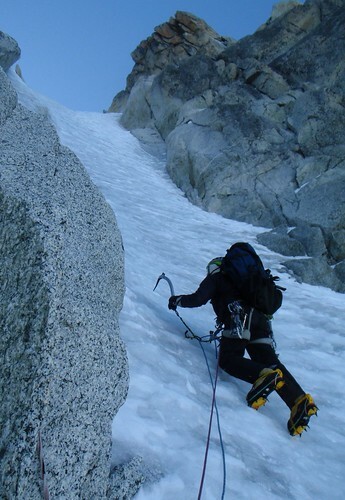 Thibault let me use one of his axes in the next pitch, the second half of the crux ice pitches, so I lead it. With 2 less screws, I eventually used all the screws, and 10 metres above the last screw at the full-stretch of the 60-metre rope, I was relieved to find a crack to accept the satisfyingly good gear to belay, which I deseparately needed to belay Thibault, who would second with only one axe. Thibault flew up without a trouble, retrieved his other axe from me, and lead the next and last pitch. From here the route continues diagonally to the left to the summit. But it is also possible to escape to the descent route by traversing right. Or, it is possible to climb on to the right to join the standard route. We were running late. To continue the route as we were is, though supposedly a lot easier than up to here, not an option. The standard route (PD) would be faster, but we still have a fair bit of way to climb to summit — we can surely summit in daylight, but will be unlikely to return to the hut before the sunset if we do. Well, we have climbed till this far, and the weather is stable — why not? So we took that (PD) option, moving together. And after more alpine actions, all at last, we summitted! It is beautiful. And tremendously satisfying. My first alpine peak since my move. There is absolutely no one in our sight. Fantastic. 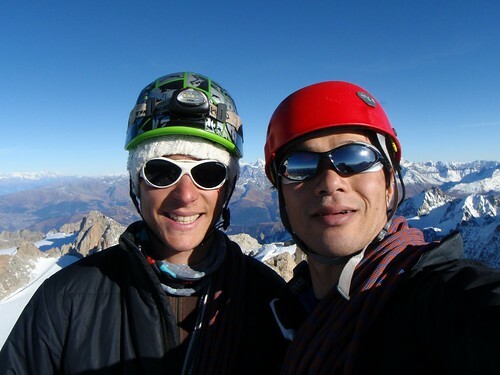 At the summit of Aiguille du Chardonnet (3824m). Descent was … scary, or I was scared. After the fall, I did lose my confidence, and that slowed me down considerably, even though I doubt if it made me/us any safer. But I know and Thibault knows I can't rush, so we proceed patiently. After a long walk and scramble down, as well as 4 abseils (with a bit of stuck rope at one stage) in the middle, we managed to descend down the steepest part of the glacier just before the last light faded away. Another 2 hours descent across the heavily crevassed glacier in dark was not a fun. 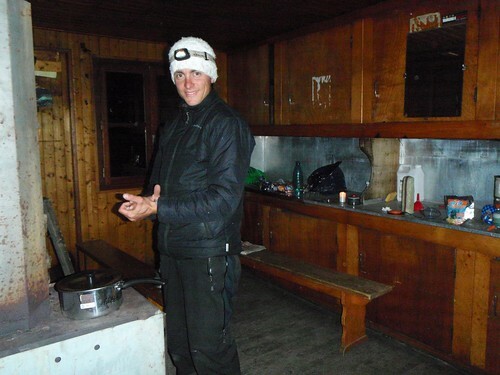 When we at last arrived back at the hut at 7pm, I was shattered, also being well aware of a pain in my bruises. What a day. Glacier du Tour and Massif des Aiguille Rouges in the morning. Shot from Refuge Albert Première at 8am. It was 15 hours activity with 1100metres ascent at altitude the previous day, my bruises hurt, and the condition of the route we had eyed up for on this day appeared to be bad, therefore all in all we decided to just descend back to the valley on this day. Note: All the photos are taken by Masa, unless otherwise stated (as copyright). Click each photo (which are linked to Flickr pages) and see the detail. Some of the original photos are found also in Bowline CC Photo Pool in Flickr. If your browser does not show some of the photos in this page, please try to click here first and then come back to this page and reload this page again.